Under different circumstances, travellers or expats in Vietnam get themselves in the situation where they have to extend their visa or worse, have overstayed their visa. This problem can be resolved depending on how long you have overstayed or how long you want to extend your visa. 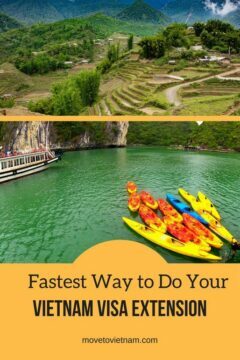 Whether you are travelling in Vietnam or living here, you will find the fastest way to do your Vietnam visa extension, from checking the different ways to do it, fees for Vietnam visa extension, and extra tips too. For faster navigation, you can use the table of contents below. Visa run to the border. The most common for travellers and expats, visa run to the border is simple. A traveller or an expat exit Vietnam and go through a land or air border and come back a few days later. In Ho Chi Minh City or Hoi an, some of travellers and expats cross the border to Cambodia and Laos, this is the fastest and the cheapest way to extend their visa. In this way, you can either obtain a visa invitation letter before you leave Vietnam or you can apply for a visa to the country (either through the embassy or a travel agency) where you will be doing your visa run to. If you are good with hunting cheap flights or your budget permits, you can consider Thailand, Indonesia, Singapore, and the Philippines for your visa run. 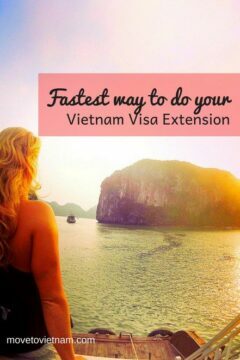 The other way is extending your visa without leaving Vietnam. In here, you need to go a travel agency who can assist you to get additional days on your visa, it could be affordable depending on the agency, your nationality and the length of extension that you want. If you decide to do a border run, you can choose to get your new visa invitation letter from a travel agency or obtain the actual visa from the embassy (of the country where you went for border run). You can also get an invitation letter from a travel agency before leaving Vietnam and get the stamp sticker when you enter again. 1. Secure your visa invitation letter from a travel agency or online before you leave or simply leave the country and find a travel agency in the country of your border run. 2. If you already have the letter, present this at the person-in-charge when you cross the border back to Vietnam. If you prefer to get the visa with the sticker on, just let your travel agency or the embassy to do this. 3. If you use an invitation letter, you have to pay $25 or $50 for the sticker at the border. Note: Invitation letter can only be used when arriving at major airports. You need to get the actual visa if you are crossing the border by land unless you find an agency in Vietnam who will address the invitation letter to the specific land border. I hope you find answers on this article about extending your Vietnam visa.